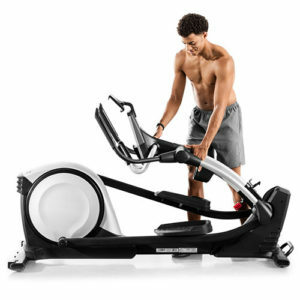 ProForm Smart Strider 495 Elliptical Review By Industry Experts! 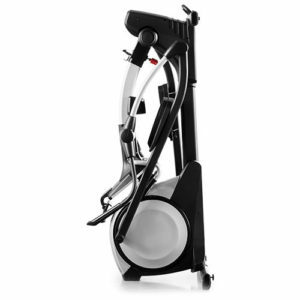 The ProForm Smart Strider 495 CSE Elliptical Trainer is ON SALE! The ProForm Smart Strider 495 CSE is an updated version of the 2013 ProForm Smart Strider 535. It comes with a number of features that makes this an interesting offer. However, realize this is a light weight machine with certain limitations. We have been moderately impressed with this machine especially considering the low price. 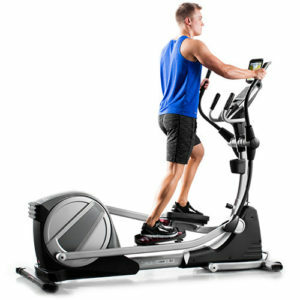 The elliptical motion is not as smooth as some of the more expensive ProForm or NordicTrack models. Both brands are built by the same parent company. Also the smaller stride length can be restricting for taller individuals. However, if your budget is limited to a max of $800, than the Smart Strider 495 should be a consideration. MID-WEEK SALE ENDS THURSDAY: The Smart Strider 495 CSE is reduced $649 with Free Shipping! No interest financing available, free shipping and a 30-day money back guarantee. This is $50 OFF the Regular Price! Less moving parts, which means less parts to fail. You tend to be better centered over the machine. Often with front drive elliptical, there is a tendency to lean forward. 13 lb Flywheel – A heavier flywheel provides a smoother and more natural elliptical motion. This is one of the main things that makes us not recommend this machine. This flywheel just is not heavy enough to provide a quality elliptical motion. If you want a heavier 18 lb flywheel, you’ll need to look at the Smart Strider 695 or Smart Strider 895 models. Incline – There is NO INCLINE feature on this machine. Once again, this is a bit of a let down. 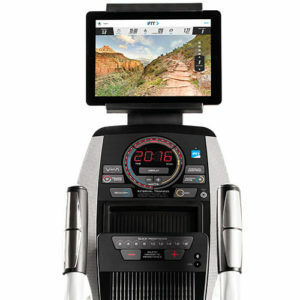 The incline features on the higher Smart Strider 695 or 895 models are worth the increase in price. Folding Feature — When folded you save approximately 3′ of space. This is attractive to people living in limited spaces. In addition, when folded the Smart Strider 495 will stand vertically once folded. This is an upgrade from the older Smart Strider 535 model. iFit Coach Ready — iFit Coach allows for two-way communication between your ProForm Smart Strider 495 and the Internet. The way it works is you go to iFit.com and create a profile. This profile will include your physical stats, but will also include your fitness goals, like losing weight over a certain time period. Based on your goals you can select a personalized workout regimen designed by professional personal trainers, including Jillian Michaels. Your customized workout is downloaded onto your elliptical trainer and includes audio coaching. With every workout your elliptical communicates your progress online. Your next workout will be progressively harder to reach your desired goal. At all times you can view and track your progress online. In addition to personalized workouts, iFit Live allows you exercise anywhere in the world. Through Google Maps™ you can map your own workout route and your elliptical will simulate the the contour of the land with the resistance. With a smart device, you can get a satellite, map, earth or street view. There are slots on the elliptical for a tablet or smart phone. In addition to mapping a route, iFit Live has a library of famous routes in places like popular city-scapes or national parks. There is an additional cost for this feature. Sound System with MP3 Input – Studies show that music motivates people when they exercise. With the ProForm Smart Strider 495 you get decent sound from the speakers, considering the price. 18 Workout Programs – Having a variety of exercise routines breaks up the monotony of exercising in place. We recommend to users that they vary their workouts. Warranty – Lifetime frame, 1 year parts, and 1 year labor. There are some models at this price range that only offer 90 days coverage. The ProForm Smart Strider 495 CSE elliptical trainer has some excellent features for the price. In particular we like the vertical folding design and the iFit Live compatibility. However, you need to be aware that this is a budget elliptical and consequently there are some limitations. It lacks a smooth and ergonomic elliptical stride and does not have an incline feature. Furthermore, the ProForm Smart Strider 495 CSE has a very light flywheel that impacts the fluidity of the motion. Finally, the Smart Strider 495 is not that heavy, consequently it will not have the stability of more expensive models. We personally would put the weight limit at around 210 lbs. Our suggestion is that you look at the ProForm Smart Strider 695 or Smart Strider 895. They are $200-300 more but is worth the extra money for a smoother elliptical stride and more stability.